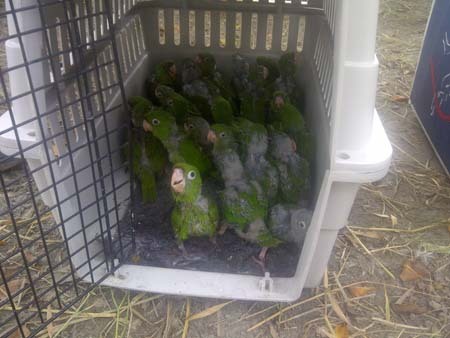 On April 2, 2012, the staff of Fundación Jambelí received notification from personnel of the Department of Natural Patrimony of the Ministry of the Environment, of the confiscation of 54 chicks of white-eyed parakeets (Aratinga leucophthalma). According to verbal report of Tec. 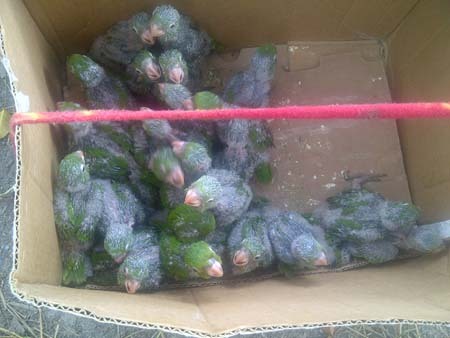 Luis Tambo of the Loja Ministry of the Environment office, the chicks were being transported illegally in a public bus in the province of Loja (in southern Ecuador). 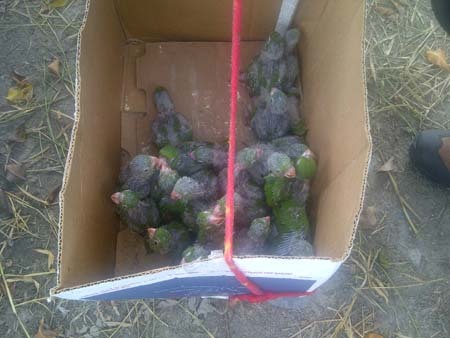 In the city of Macará, the bus was inspected by personnel of the National Police and they found the birds in the baggage compartment, but the passenger carrying the birds was never identified. 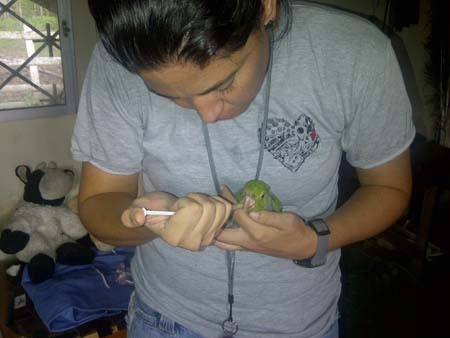 The chicks were later cared for by staff members of the Loja Municipal Zoo before they were transferred to Fundación Jambeli’s Wildlife Conservation Center located near Guayaquil. On April 3, 2012, the chicks arrived at the Center and were evaluated by veterinarian Julio Baquerizo, who noted a slightly prominent keel, which is usually a sign of a lower nutritional condition. The chicks arrived weighing an average of 122 grams; only four individuals were under 100 grams. James Gilardi of World Parrot Trust was consulted for bird care advice and support, and soon got in touch with José Diaz who has been providing valuable information on nurturing the chicks including detailed feeding, rearing and management procedures. After a couple of weeks, the average weight was above 150 grams. They were separated into two groups according to weight. Individuals in the first group were already feeding alone and some of them started to fly. Birds on group 2 were also beginning to show more independence as well. They are slowly becoming a homogenous group and preparations are being made to transfer them to a bigger aviary for their adaptation, where they can develop and practice flying prior to their release. The chicks have been receiving dedicated care from zookeeping staff, especially Justo Banchón and Priscilla Pineda, and volunteers Andrea Manosalvas and Jacqueline Giler.